Living as many of us do in a democracy, we’ve been indoctrinated with the importance of “majority rules”. So entrenched is this idea that it can take on mythic proportions, a kind of pillar of the universe status. The righteousness of democracy and the efficacy of majority rules politics are seemingly beyond reproach. And, by and large, they work. Problems arise, however, when these principles migrate to other regions of thought. A minority opinion can suddenly become subversion or even treason. George Orwell’s “thoughtcrime” in motion. Zionism has, following the collective trauma of the Holocaust, become the conventional opinion. Its popularity raises a valuable question. Zionism, riding on the coattails of previous secularizing movements, found fertile ground amongst many European Jews who had been battered by years of often government sponsored secularization efforts. European Enlightenment and its accompanying Jewish counterpart, pushing a process of modernization which varied from place to place, stripped many Jews and non-Jews of their traditional, often religiously based, outlooks and identities. The new marketplace of ideas led to an explosion of movements, some bordering on genius and others on madness. As “secularism” became a byword, the masses groped for something, anything to fill the vacuum left by the demotion of religion. Many Jews, tragically, felt the moment ripe for throwing off the yoke of Torah. Over a hundred years of this upheaval preceded Zionism. When it finally made its debut, it was treading on European soil bristling with something new and possibly more insidious than its predecessors. 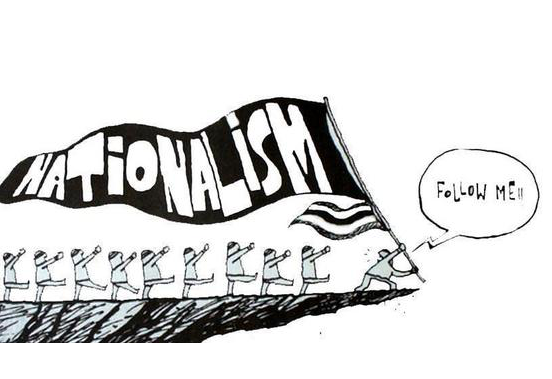 Nationalism. Nationalism, far from being of primordial nature, as espoused by Johann Gottlieb Fichte and Johann Gottfried Herder, didn’t come into its own till around the 1880s (Hobsbawm). In fact, the Dictionary of the Royal Spanish Academy didn’t use the term “nation” or “state” in the modern manner till 1884. It was a movement that obliged newly formed nationalities to form, as historian Benedict Anderson called it, “imagined communities”. Gloomy vaticination aside, Mr. Krantz is a classic example of the “iron wall” mentality that Vladimir Jaobtinsky epitomized. Only through a consistent propping up of the Zionist dream can we save ourselves, G-d forbid. All else equals extinction. All this and more came together to create a civil replacement theology pulsating with fear of unseen massacres. Israelis have been conditioned to believe that any minute could be their last, compelling them to act accordingly. A man who imagines himself backed into a corner will often resort to violence. Israeli citizens envision themselves as citizens of an embattled nation wreathed in a consuming fire. The saddest part is, their government robbed them of existential meaning and set the match. Though a minority, Anti-Zionist Jews number in the hundreds of thousands. Zionism could possibly be the majority opinion amongst Jews worldwide, which is debatable, but what sort of majority is it? One which must ceaselessly pursue war, physical and ideological, to hide how empty and unsatisfying it is. Utterly empty.